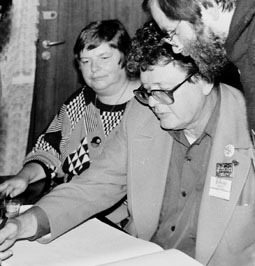 "The Saturn Game" is a science fiction novella by American writer Poul Anderson, originally published in Analog Science Fiction and Fact in February 1981. Imaginative roleplaying provides relief for some of the crew on the long, dull trip to Saturn. However their imaginary world becomes hazardously confused with the real one when a team begins the exploration of Iapetus, one of Saturn's moons. Iapetus, or occasionally Japetus, is the third-largest natural satellite of Saturn, eleventh-largest in the Solar System, and the largest body in the Solar System known not to be in hydrostatic equilibrium. Iapetus is best known for its dramatic "two-tone" coloration. Discoveries by the Cassini mission in 2007 revealed several other unusual features, such as a massive equatorial ridge running three-quarters of the way around the moon. "The Saturn Game" won the 1981 Nebula Award for Best Novella and the 1982 Hugo Award for Best Novella. The Saturn Award for Best Actress is one of the annual Saturn Awards given by the American professional organization, the Academy of Science Fiction, Fantasy & Horror Films. 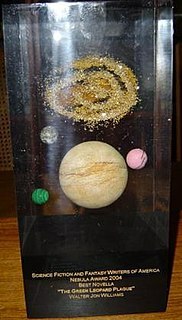 The Saturn Awards are the oldest film-specialized reward of achievements in science fiction, fantasy, and horror. The Saturn Award included the Best Actress category for the first time in the 1974 film year. The Saturn Award for Best Animated Film is one of the annual awards given by the American professionnel organization, the Academy of Science Fiction, Fantasy & Horror Films. The Saturn Awards, which are the oldest film-specialized awards to reward science fiction, fantasy, and horror achievements, included the Best Animated Film category for the first time only in 1978, was revived in 1982, and still currently reactivated since 2002. Nightflyers is a science fiction horror novella by George R. R. Martin, released as a short novella in 1980 and as an expanded version in 1981. A short story collection of the same name was released in 1985 that includes the novella. In 1987, the short novella was adapted into a film by the same name. A 2018 television adaptation of the extended novella was developed; television presentation began on December 2, 2018, on the SyFy Channel. The show was cancelled after a single season on February 19, 2019. 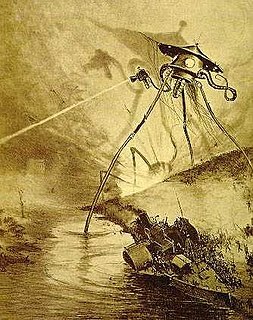 The 1981 Annual World's Best SF is an anthology of science fiction short stories edited by Donald A. Wollheim and Arthur W. Saha, the tenth volume in a series of nineteen. It was first published in paperback by DAW Books in May 1981, followed by a hardcover edition issued in August of the same year by the same publisher as a selection of the Science Fiction Book Club. For the hardcover edition the original cover art of Michael Mariano was replaced by a new cover painting by John Gampert. The Best Science Fiction of the Year #10 is an anthology of science fiction short stories edited by Terry Carr, the tenth volume in a series of sixteen. It was first published in paperback by Pocket Books in July 1981, and in trade paperback and hardcover and trade paperback by Gollancz in the same year. The Best Science Fiction of the Year #11 is an anthology of science fiction short stories edited by Terry Carr, the eleventh volume in a series of sixteen. It was first published in paperback by Pocket Books in July 1982, and in hardcover by Gollancz in the same year. The 42nd Saturn Awards, honoring the best in science fiction, fantasy, horror and other genres in film, television, home media releases, and theatre in 2015 and early 2016, were held June 22, 2016, in Burbank, California. The awards were presented by the Academy of Science Fiction, Fantasy and Horror Films, and hosted by actor John Barrowman. The nominations were announced on February 24, 2016. This edition featured several heavy changes in the Television categories, with all "Best TV series" categories being replaced by new ones, with the exception of Best Superhero Adaptation Television Series. The Saturn Award for Best Science Fiction Television Series is one of the annual awards given by the American Academy of Science Fiction, Fantasy & Horror Films. The Saturn Awards, which are the oldest film and series-specialized awards to reward science fiction, fantasy, and horror achievements, included the category for the first time at the 42nd Saturn Awards ceremony, when the Saturn Award went through major changes in their television categories. It specifically rewards science fiction on television. The Saturn Award for Best Fantasy Television Series is one of the annual awards given by the American Academy of Science Fiction, Fantasy & Horror Films. The Saturn Awards, which are the oldest film and series-specialized awards to reward science fiction, fantasy, and horror achievements, included the category for the first time at the 42nd Saturn Awards ceremony, when the Saturn Award went through major changes in their television categories. It specifically rewards fantasy on television. The Saturn Award for Best Production Design is one of the annual awards given by the American professional organization, the Academy of Science Fiction, Fantasy & Horror Films. 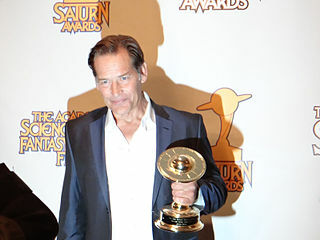 The Saturn Awards, which are the oldest film-specialized awards to reward science fiction, fantasy, and horror achievements, included the Best Production Design category for the first time for the 2009 film year. Nebula Award Stories Seventeen is an anthology of award winning science fiction short works edited by Joe Haldeman. It was first published in hardcover by Holt, Rinehart and Winston in August 1983; a paperback edition was issued by Ace Books in June 1985 under the variant title Nebula Award Stories 17.